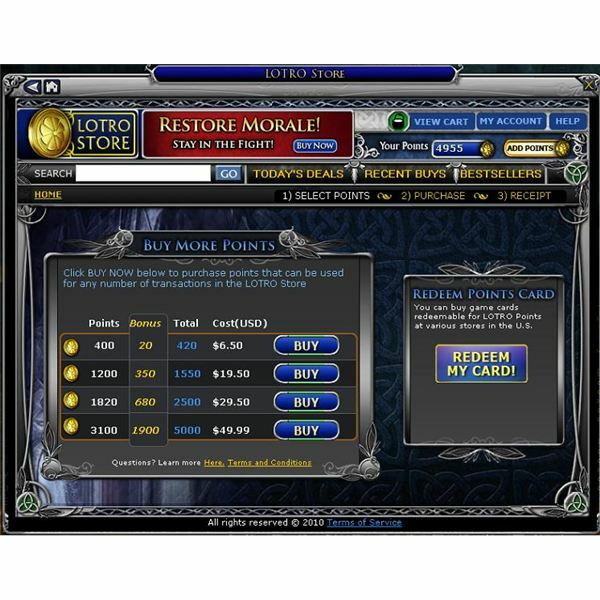 In September of 2010, Lord of the Rings Online, or "LOTRO" for short, an already quite successful MMORPG set in the Lord of the Rings universe, became free to play. 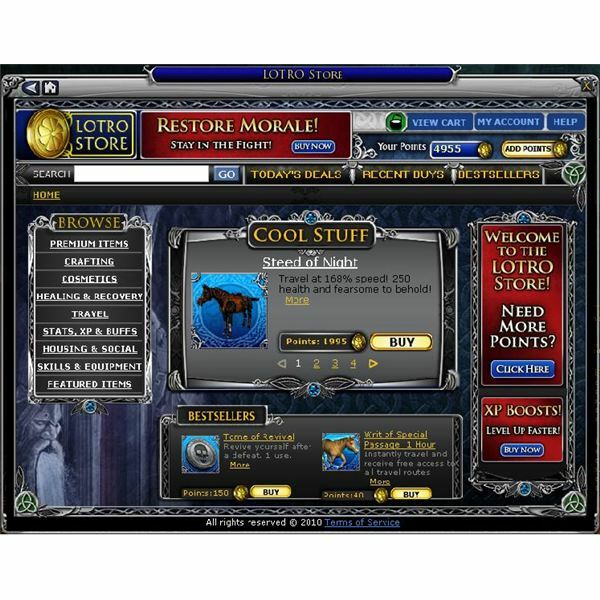 In changing their MMO to a free to play model, all of the company's revenue comes from charging for premium content through the store, so the interface and usability of the store is pretty crucial. Luckily, the interface is quite good. 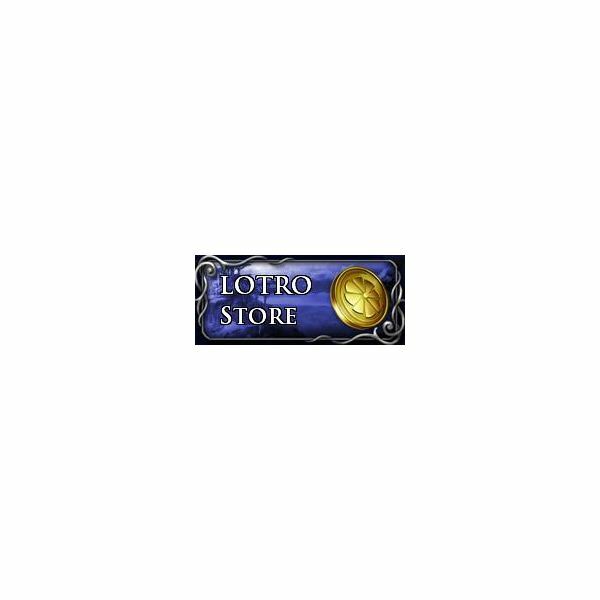 The store can be opened at any time from an easily noticeable button labeled "LOTRO store" on your toolbar. Categories are easy to browse, making it quite easy to tell what they have for sale. As well, they have daily deals that load on the front page of the store when you first open it, and two featured items sections, "new to LOTRO" and "staff picks," that make it easy to find some of the newer additions if you've checked the store recently and just want to see what's been added. As far as interface goes, I really only have one complaint. It is, unfortunately, a rather large complaint. The store loads its inventory based on the character that the player is currently logged in as, showing you only things available to that class and level. I understand not letting you purchase something you can't use, but most people have a few alternate characters or "alts," and if the store could show you things your other characters might need and simply grey them out, it would save the time of logging in and out repeatedly to browse the store. This is a huge oversight in my mind, and hopefully something Turbine will eventually change, as the rest of the store's interface is really very good. There are a lot of things in the store. Depending on the type of account you have, much of the content and classes may not be available to you for free. Those are all available for purchase, as are both of the expansion packs that came out prior to the game becoming free. The new Isengard expansion that's due for release in Fall of 2011 will also be available for purchase directly from the LOTRO store. Class slots, inventory expansions, crafting recipes and materials, social emotes and housing decorations, mounts, stat upgrades, and so many more things, can all be purchased to expand your experience with the game. There are a handful of things someone might want that aren't there yet, but overall, it's very well stocked, and it's well stocked with genuinely useful items that people are actually going to want. This is another thing that's obviously pretty crucial to the success of the store, and the game has actually doubled in profit since switching to the free to play model. I suspect that the quantity and quality of items available in their store is a big part of that success. Great stock is one thing, but if it never changes, that profit is going to bottom out pretty quickly. Turbine has been exceptional about updating the items in the store. New things are constantly going up, and the daily deals provide an on-going rotation so that you might see something you've overlooked, and see it on sale no less. Staff picks change frequently as well, so checking in on what the company recommends every so often will often give you a new list as well. Most of the time, if there's something that seems to be overlooked, like it should be in the store, it's only a matter of time before it will be. For instance, crafting is a big part of the game, and when the store launched, it had crafting recipes, but no crafting ingredients for sale. It always seemed to me that people would be more likely to buy materials than recipes to save time farming for them, and now, ingredient packs are available. The store-bought ingredients cause items to bind to you, so if you want to craft things to give or sell to other people, you still need to get your own materials, but if you're just trying to level up your crafting experience, you can buy that from the store. That's just one example. Faster mounts were added due to demand, and cosmetic items are constantly going up because of demand, as well festival items people missed, and many other things. Turbine has been fantastic about keeping their stock fresh and giving players a reason to check in on the store every so often. So, we've established that there are lots of good things to buy in the LOTRO store. That's great, but it's not worth much if they cost an absurd amount of money. Currently, the pricing scale ranges from 420 points at $6.50 USD at the bottom to 5000 points at $49.99 USD, with a couple other options in between. So, if you buy in bulk, you're getting 100 points to the dollar, and if you buy fewer points, you're getting a little less than that. Bulk is always cheaper, but the difference isn't astronomical, so for those that only need a few points, you're not going to feel like you're getting ripped off. As far as what that actually means, 5000 points is quite a lot. Those ingredient packs I mentioned earlier are 25 for 1, 100 for 5, and 175 for a pack of 10. There are permanent stat upgrades for your character for as little as 295 points, and permanent mounts are only 695. The store-exclusive mount, which is 168% normal speed and 250% normal health, sells for 1955 points, which is less than twenty bucks for a pretty seriously premium item. In addition to that, they do have sales very frequently, so if you watch for those, you can save some money. As well, there are a couple of pricing options available to gamers. The game is free, but you do have the option of choosing to pay monthly, which, in addition to unlocking all the content in the game, provides you with 500 free points per month that you maintain an active subscription. That's a $5 return monthly on the $15 fee, making it essentially $10 a month if you choose to play it that way, which is still a lot cheaper than most MMOs. Finally, they do give some free points away for in-game achievements, so turbine points can be earned as well to save some money. In the end, if you buy a lot of things from the store, it's going to cost you, because this is a business model and they're looking to make money, but unless you go crazy and buy every item whether you need it or not, the amount most people are going to buy is going to end up being pretty affordable. The LOTRO store is now Turbine's only source of income for The Lord of the Rings online. With that in mind, it stands to reason that Turbine would have put some work into implementing it well, and continuing to utilize it properly. What this translates to for the gamer is a great experience with the store and ultimately, a great experience with the game. Lord of the Rings Online is now free to play, so it's easy to try it and see if you like it. If you do find that you enjoy it, and you want to add some things to your account so you can get more out of it, the store is right there, ready to take your money, and between the quality of items and the pricing, as well as the quality of the game itself, there are much worse things you could be spending that money on. There are a few kinks to iron out, but Turbine does seem to paying the store a fair amount of attention, so it's generally only a matter of time before something bothersome gets fixed. In the end, the LOTRO store makes for an expenditure you won't regret. A collection of review of Lord of the Rings Online and things related to it.